Hyundai Asia Resources, Inc. (HARI), the official distributor of Hyundai vehicles in the country displayed bullish growth for the first three months of 2016. Ending the first quarter with 7,469 units, sales are up by 39 percent compared to the 5,364 units sold in the first quarter of the previous year. Quarter-on-quarter results also show auspicious results in automotive sales as the company also posted an identical 39 percent growth. The Passenger Cars (PC) segment surged by 42 percent or 5,186 unit in the 1st quarter as compared to the 3,653 units sold in the same quarter of 2015. Light Commercial Vehicles (LCV) contributed substantially with 33 percent growth compared to the same period of the previous year. 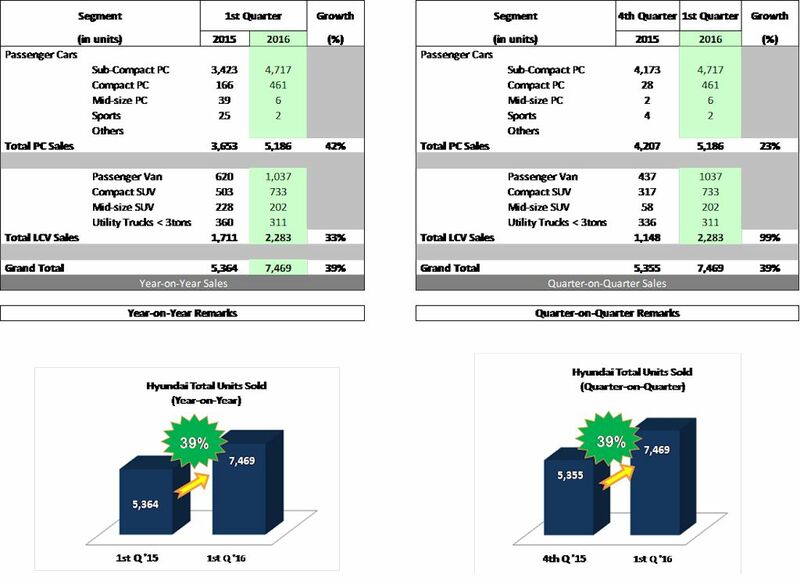 On the other hand, quarter-on-quarter results show a 23 percent pick up in sales for PC and a 99 percent increase for LCV.